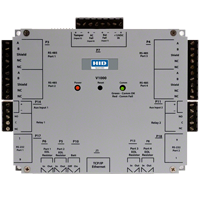 HID VertX EVO™ V1000 is a Networked access controller with a multi-door access control Panel. It reduces the burden on corporate Local Area Networks (LANs) by connecting up to 32 door controllers using only one IP address. The high performance platform increases door uptime while the master controller minimizes corporate LAN overhead by providing access control decisions for up to 64 readers. VertX EVO V1000 makes all online door decisions, input monitoring and output control for all connected interface modules, including VertX® V100(door interface), V200(input monitor) and V300(output control). The V1000 has two on-board inputs and outputs for local input point monitoring and auxiliary output control, and is powered by a local power supply (12 or 24 VDC). Provides a complete and fully functional hardware/firmware infrastructure for access control software host systems. Enables the replacement of head end software without visiting the access control panel, reducing chang out costs. Connects to the host and other devices on a TCP/IP network. Receives and processes real-time commands from the host software application. Reports all activity to the host; reports supervised inputs/alarms with 255 priorities. Provides fully functional offline operation when not actively communicating with the host access control software application, performing all access decisions and event logging. Access Control System interfaces with combinations of devices with a maximum of 32. Designed to deliver secure access control for multi-building or multi-branch enterprises. The solutin allows to Manage Multiple Companies from single server and shared access control infrastructure such as in the case of IT parks, providing complete confidentiallity of one company data from another company. Real time door & event monitoring with support for security hardware such as biometric readers, CCTV cameras, fire alarm system, boom barriers and turnstiles. Support for long distance tamper-proof and clone proof Asset and Vehicle tags facilitates the authentication, tracebility and tractability of valuable assets and vehicles entering or leaving the premises.